Considering everything we have looked at recently to do with insecurity, how we all seem to be managing some form of inner issue, something that may have been triggered a week ago, a month ago or even years ago. These compulsive insecurities that mean we limit the way we live, to minimize the pain we can cause ourselves, ironically meaning we miss out on some of the most outstanding, life affirming experiences we lust for. I choose to believe we are all fully aware of these desires (when we want to), yet for some reason choose to not pursue them. Perhaps because of how we see the world, how it never works for “people like me” in the world, or maybe its something to do with the way we see ourselves and other people’s opinions of us. This is something that arguably makes us appear self centered and narrow minded. As i have probably mentioned at some point on TE, we all make assumptions about the world and the people in it, as do we make assumptions about the way people see us, what they expect us to do or not do, hope for and ignore. In its most basic form, we think too much. We feel like we need to be able to figure it all out before we actually do anything, this way we can prepared the backups, have a “way out” or a way “forward” in every situation. These insecurities do raise an interesting idea that in recent times, with connections to people and things possible through the tap of a few keys we seem to have dialed out the idea of being “surprised.” Maybe surprised is the wrong word, maybe its that we don’t believe in ourselves, or even the world these days. Its because of this lack of belief that we start to ignore the desires, forget about them and go about living our lives like we are supposed to, spending more time avoiding something that could affect us in the most fabulous way, because it might cause us pain. This means a critical part of who we are, and more importantly who we want to be, can be lost. Lost simply because we no longer know our why. We can be beaten down by things, real or imaginary so completely we don’t really know what we want, we don’t really know why we would do anything more than what we are doing right now. I could continue to write about how its a terribly depressing sensation, not really wanting anything, anyone, but the vast majority of the time, i don’t think we tell the difference. We just go about our lives, doing hat we need to do, and being the way we need to be, convinced everything is alright. However, its the lesser times, the quieter, more alone moments we are interested in here. Those times where you are alone with your own thoughts, considering your life, what love means and everything else in between. These quiet moments where there are no walls, no guards, no fail safes and nothing stopping you thinking or considering anything, is where we feel at our weakest, as there is nowhere to hide. I feel like when we are “alone with our thoughts” it can feel like a flood, as if for as long as we ignore them, with a flick of a switch they can pour back through the cracks in our walls, leaving us feeling vulnerable and defenseless against ourselves. This feeling is the most critical step to understand the insecurities we battle with each day, because it allows you to know your why. You can push as hard as you like, run faster, jump higher, be the bigger energy in a world that would rather you didn’t and believe your capable of being part of something so much bigger, but if you don’t know why, there is no real drive, no motivation to keep you pressing forward. 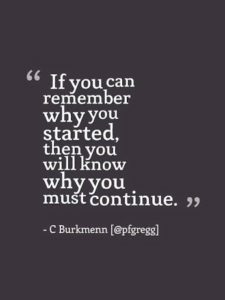 We need to have a why, because when you try something, when you want something more than your next breath, if you don’t really understand what it means, or what it truly us, we can easily lose focus and maybe more relevantly, lose interest. 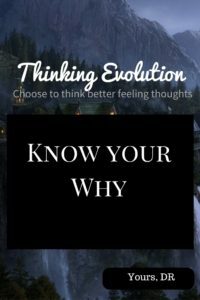 So i implore you to look into yourself and ask, what is your why? What do you hope for your life- what do you want to achieve? What drives you forward in the morning, and leaves you exhausted at the end of the day? Understand you why and know you can choose. Choose to think better feeling thoughts, and be a part of a Thinking Evolution. Until next time people, DR.